I recently built a desktop system that I think is reasonably secure. It’s running Debian sid, also known as “unstable” — though in the Debian desktop world that just means you get to use the newest software. It’s just about as stable as “stable”, and besides, #yolo. It’s also running a grsecurity-patched Linux kernel and PaX, technologies that make Linux way more secure. Grsecurity protects you against memory corruption attacks, such as buffer overflows. Since I just set up Debian with a grsec kernel, I figured I’d write a tutorial for how to do it. It’s still a long way before the average user can take advantage of this stuff – it breaks everything, and the user needs to learn how to diagnose and fix it themselves – but I think that it’s well within the capabilities of Linux nerds who are comfortable using a terminal. You can probably also follow along no matter what Linux distribution you’re using. Also, I’m fairly new to grsecurity myself, so if you have tips or suggestions, or if I got something wrong, please post in the comments. Grsecurity can be used with very little configuration. Just by baking it into your kernel, entire classes of exploits will fail to work against you, but those same exploits will succeed against someone running a vanilla Linux kernel. Grsecurity also lets you enforce access controls, but that’s outside the scope of this article. Just running a grsec kernel gives you a lot of protection for free. First, I’m going to explain a little bit about what grsec is and how it protects you. Then I’m going to install Debian and upgrade it to sid. Then I’m going to download the Linux source code and the grsecurity patch, verify digital signatures, patch the Linux kernel, and finally compile it. (If you’ve never compiled the Linux kernel before, you’re in for a treat!) Then I’m going to show you how to use paxctl to turn off certain PaX protections on specific binaries so that they can run without crashing. And finally, I’m going to briefly show you how to troubleshoot grsec and PaX, so you can make software work that would otherwise crash, all on your own. How does grsecurity make Linux more secure? Memory corruption attacks normally work something like this: The target accepts malicious input into a program (maybe they load a GIF in an image viewing program, or a document in LibreOffice, or a malformed PGP public key in GnuPG). This input includes an exploit – some code that triggers a security bug in whatever software it’s targeting – as well as a small block of malicious code called shellcode. When the buggy software parses the input, the exploit takes over the flow of execution and jumps into the attacker’s shellcode. Shellcode can do many different things, but it commonly gives the attacker a remote shell – basically, letting them run commands on the victim’s computer (with the permissions of the user who was running the program that got hacked). Grsecurity protects you by being extremely strict about which parts of memory are allowed to get executed. If it sees a program try to execute some code in the wrong part of memory, it kills the process, which will thwart attacks. So if a target using a grsec-patched kernel loads a malicious PDF in a vulnerable PDF reader, and it exploits a bug and tries to jump to shellcode, grsec will kill the process and log this to /var/log/syslog. You can still run a web browser with grsec, but you need to set a PaX flag (more on this below) to disable memory protections on that specific executable binary. This means your browser won’t immediately crash when you open it, but it also means that if an attacker is able to exploit a bug in it, they may be able to succeed in running their shellcode. Likewise, you often need to disable memory protection on programming language interpreters, such as /usr/bin/python2, /usr/bin/python3, and /usr/lib/jvm/java-7-openjdk-amd64/jre/bin/java. So it’s not perfect. But even with disabling memory protections on specific binaries, you still get a lot of protection. Most programs work fine without having to disable any protections, and grsec makes it extremely hard for an attacker to escalate privileges. So if someone does manage to hack your web browser and get a shell, grsec will probably prevent them from getting root. Or if you’re a web developer and are running Apache with an old vulnerable WordPress on it that someone on your wifi notices and hacks, grsec will probably prevent them from accessing any data that isn’t readable from the www-data user, even if they come armed with Linux privilege escalation exploits. Debian doesn’t release sid installation images. Instead you need to install an earlier version of Debian and upgrade to sid. So go and grab the latest stable netinst iso, probably the amd64 one. You also may want to verify the signature of the iso. As of this writing, the latest stable is 8.2.0, and the iso URL is http://cdimage.debian.org/debian-cd/8.2.0/amd64/iso-cd/debian-8.2.0-amd64-netinst.iso. If you drop the filename part of the path and just load http://cdimage.debian.org/debian-cd/8.2.0/amd64/iso-cd/, you’ll see several files to downloading, including SHA512 and SHA512.sign. Download both of those. The SHA512 file contains SHA512 checksums of all of the isos for that version of Debian, including debian-8.2.0-amd64-netinst.iso. Now let’s check to see if that checksum is in the SHA512 file. Great, the signed SHA512 file shows the same checksum for debian-8.2.0-amd64-netinst.iso that I got manually. This means that I’ve confirmed that the Debian netinst iso I downloaded hasn’t been tampered with. Finally, burn the iso to a CD or dd it to a USB stick, boot to it, and install Debian. Note that when it asks for you to come up with a root password, you can leave it blank. If you do this, then Debian will make your user a sudoer. This might be more familiar to you if you’re used to Ubuntu or Mac OS X. When you get to the “Partition disks” screen, choose “Guided – use entire disk and set up encrypted LVM” in order to set up full disk encryption. You’ll need to come up with a strong passphrase. When you get to the “Software selection” screen, make sure to select GNOME as your desktop environment. That’s what I’m using, and this tutorial includes setting a PaX flag to make GNOME work. Reboot into your freshly installed Debian, mount your encrypted hard drive, and login. Now it’s time to upgrade from stable to sid. Open a terminal and edit the /etc/apt/source.list file as root. Save and exit. Now, update all of the software. This will take awhile. And finally, reboot into sid. The Debian wiki’s grsecurity page implies that linux-grsec is packaged in sid already, but it doesn’t seem available yet. In the future this will be much simpler, but for now we can compile the Linux kernel ourselves. Update: Grsecurity is indeed packaged in sid. The package name (right now) is linux-image-4.3.0-1-grsec-amd64, so you can apt-get install that instead of compiling it yourself if you want. Download the public keys that are used to sign the Linux kernel source as well as the grsecurity patch. You can find the latest Linux kernel signing key here, and you you can find the latest grsecurity signing key at the bottom of this page. Now download the Linux source code and the grsecurity patch. You’re going to need to download the latest stable version (not any of the longterm versions), because the grsecurity project only releases that version publicly. Because these versions numbers change constantly, I’m not going to provide direct links. Download the latest stable Linux source, as well as the associated PGP signature file, from kernel.org. The files I’m downloading are called linux-4.3.3.tar.xz and linux-4.3.3.tar.sign. Download the corresponding grsecurity patch, as well as the associated PGP signature file, from grsecurity.net. This will be under the header “test kernel patch”. The files I’m downloading are called grsecurity-3.1-4.3.3-201601051958.patch and grsecurity-3.1-4.3.3-201601051958.patch.sig. If you’re following along with a version of Linux that’s newer than 4.3.3, type the following instructions yourself instead of copying and pasting, so that the commands correspond with the version of Linux and grsec that you downloaded. Decompress the Linux source code. Verify the signatures. The output of both of these should say “Good signature”. If all went well, extract the Linux source code and then apply the grsec patch. Start with your existing Linux kernel configuration. Note that it’s possible that your config file might be named differently if you currently have a different version of the Linux kernel installed, so make sure you use the right filename. Navigate to Security options, Grsecurity, and make sure it’s enabled. 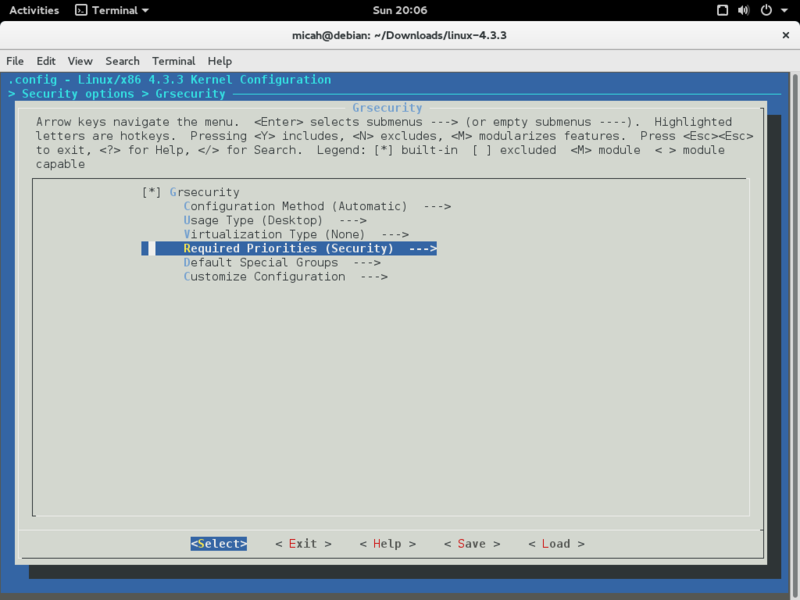 Then go to Configuration Method and set it to Automatic. Go to Usage Type and change it to Desktop. Go to Virtualization Type and set it to None (unless you’re testing this in a VM, then make sure you choose the right hypervisor). Go to Required Properties and set it to Security. You can use all of your CPU cores to make compiling the Linux kernel faster by running this. $ export CONCURRENCY_LEVEL="$(grep -c '^processor' /proc/cpuinfo)"
Now compile the kernel. This will probably take a really long time. When you’re done you’ll have a deb file you can install. When this finishes, install the new Linux kernel image. Now let’s make sure you GRUB boots into this kernel image by default. Figure out what the kernel version string that GRUB will use is called. $ grep menuentry /boot/grub/grub.cfg | cut -d "'" -f2 | grep "grsec$"
Now edit /etc/default/grub and change the GRUB_DEFAULT= line be to "Advanced options for Debian GNU\/Linux> followed by the kernel version string. 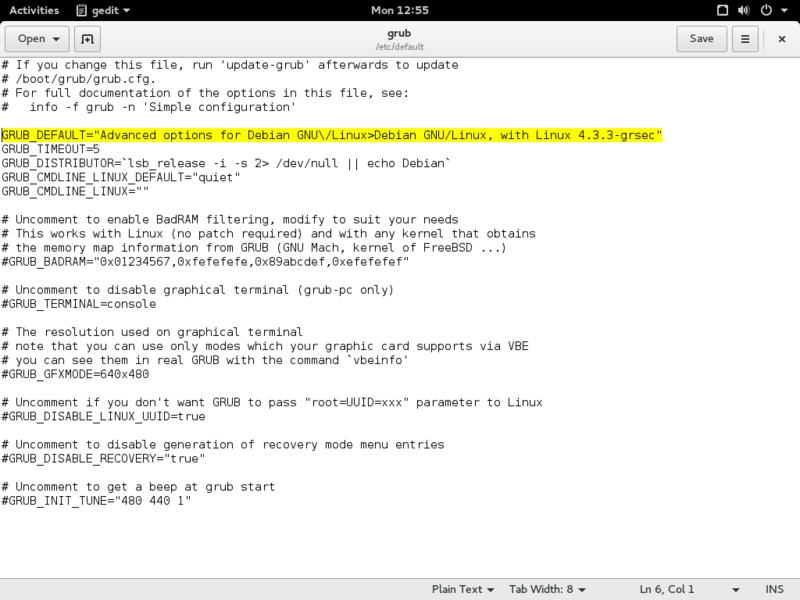 Put the whole things in quotes, like this: GRUB_DEFAULT="Advanced options for Debian GNU\/Linux>Debian GNU/Linux, with Linux 4.3.3-grsec"
Save and exit, and then upgrade grub. Before rebooting into the grsec kernel, we need to install PaX tools, which will let us disable memory protections on specific userland binaries. When you boot into the new kernel, everything will be broken. This is because grsec is killing the gnome-shell process. In order to make your desktop environment work, you need to disable memory protections on the gnome-shell binary. Press Ctrl-Alt F1 to switch to tty1 and login without graphics. Then disable memory protections on /usr/bin/gnome-shell using paxctl (more on how this tool works below). Here’s the command to run. Reboot again, and this time GNOME should work. Login to your account, and open a terminal to do a few final steps. Now, make sure that grsecurity is really working like it should. Return to function (strcpy)              : paxtest: return address contains a NULL byte. Return to function (strcpy, PIE)         : paxtest: return address contains a NULL byte. Congratulations, you’re running Debian with a hardened grsecurity kernel! But you’re not done yet. Lots of your software is going to crash as soon as your run it. The next section shows you how to fix that. Thanks to the Kevin Gallagher and the Freedom of the Press Foundation staff for making a great guide that I mostly based this section off of. Grsecurity automatically kills processes that use memory in a way that could be an attack. But many programs legitimately use memory this way. In order to use those programs, you need to set PaX flags on their binaries — these flags actually get stored in the binary file’s header. paxctl is a program that lets you view and set these flags. Earlier we ran paxctl -cm /usr/bin/gnome-shell. The -c modified the binary so that it’s able to accept PaX flags, and the -m disabled MPROTECT — basically meaning that that specific binary is allowed to do stuff that grsec would kill other binaries it caught doing. You can view the flags that are set like this. For the most part, all you’ll ever need to do is use paxctl -cm on a binary that you trust to run without MPROTECT. You can always run paxctl -M to enable MPROTECT on it again. There’s also a cool looking project called paxrat, developed by Subgraph, that helps you manage PaX flags. It’s not yet packaged for Debian, and I haven’t yet tested it out, but I look forward to playing with it. For now we can just use paxctl. To start, let’s set PaX flags for some GRUB binaries. One issue I’ve run into when trying to set PaX flags with paxctl is an error message that says “Text file busy”. If you run into this issue, you can kill any processes of that binary that are running and then try again. If you have a hard time keeping a process killed, you might try rebooting into recovery mode to set its PaX flags. How do you know what binaries you should set PaX flags on? Grsec logs its error messages to /var/log/syslog, so let’s start by opening a new terminal and watching all of the grsec error messages that scroll by. Now, in a new terminal window, try opening Iceweasel by running its binary. Iceweasel was killed by grsec, and here’s the error message that was logged to /var/log/syslog. If you want to use Iceweasel (and risk turning off its memory protections), then use paxctl to disable MPROTECT. Now trying running iceweasel again. It should just open this time! Now, try opening a new tab. My syslog window throws two more errors. It looks like each time you open a tab, Iceweasel tries running /usr/lib/iceweasel/plugin-container in a subprocess, and grsec kills that process. However, Iceweasel appears to work fine without it, so no big deal. Since it hasn’t affected me yet, I’m going to keep MPROTECT enabled on that binary. If you need to run a plugin in Iceweasel and grsec prevents that from working, then you might consider disabling MPROTECT. Edit /etc/apt/sources.list as root, add the “contrib” repository. Now install Tor Browser Launcher. Now try launching Tor Browser. It should pop up a window and download the Tor Browser tarball for the first time. It should also download its PGP signature, verify the signature, extract the tarball, and then try to launch Tor Browser. But when it does, grsec kills the process. Tor Browser is trying to run the /home/micah/.local/share/torbrowser/tbb/x86_64/tor-browser_en-US/Browser/firefox binary, and it fails for the exact same reason that Iceweasel fails. To fix it, disable MPROTECT on that binary. This time, Tor Browser will launch without any crashes or grsec errors. How does Debian with grsecurity compare to Qubes? I’ve written in the past about how awesome Qubes is, which is also a reasonably secure operating system. So how does it compare to Debian with a grsec kernel? For example, let’s say an attacker sends you a malicious PDF that secretly exploits a bug in Evince, a popular Linux PDF viewer. Pretend you’re running Qubes and decide to open this PDF in your “personal” security domain that you use for non-work related stuff (really you should open it in a disposable VM, but maybe you didn’t think it was that risky or something). The PDF exploits the bug in Evince and jumps into the attacker’s shellcode, and now the attacker can run whatever commands they want and access any of your data, but only within your “personal” AppVM. They can’t access any of the files in your “work” domain, or your “email” domain, or the networkless “vault” domain that you use to store your PGP secret keys and password databases. Now pretend you’re running Debian/grsec. You open the PDF, it exploits the bug in Evince and tries to jump to the attacker’s shellcode, but grsec detects that your Evince process is trying to execute code in an off-limits part of memory and kills the process. Evince immediately closes, grsec logs an error to syslog, and you don’t get hacked at all. In this case, grsec completely prevented the attack, while Qubes only contained it. But now let’s change the example. Instead of Evince, the attacker is exploiting a bug in Iceweasel. If you’re using Qubes, the attacker only hacks the domain that you’re running Iceweasel in. If you’re using Debian/grsec (and you disabled MPROTECT on /usr/lib/iceweasel/iceweasel like we did above), the attacker’s shellcode will run and they’ll have access to all of your files, be able to log your keystrokes, etc. They might have a very difficult time getting root, which will make it harder for them to install a persistent backdoor, but that’s little consolation. Hardening your kernel with grsecurity is great because it makes it much harder for attacks against you to succeed, but it still doesn’t make it so you can compartmentalize your computer the way that Qubes does. It’s also important to remember that grsec mostly protects you against memory corruption bugs, but other types of security issues exist too. You might run an ssh server and use a crappy password. 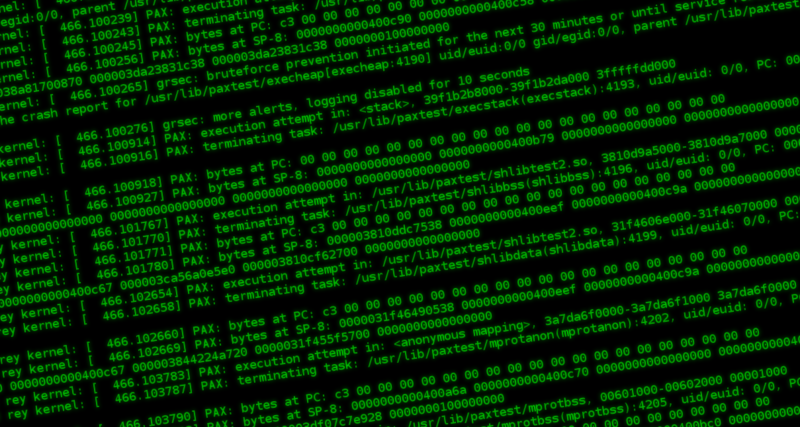 You might get tricked into copying and pasting something malicious into your terminal. You might be running buggy software that can be exploited without jumping into forbidden memory space, so grsec won’t catch it. There’s another big difference between Qubes and Debian/grsec: Usability. Qubes isn’t terribly hard to use (for experienced Linux nerds), but it does require shifting the paradigm about how you think about operating systems, and working around software that isn’t designed for it. For example, it’s not uncommon to have four or five different web browsers open at the same time, all running in different security domains for different purposes. If someone sends you a link, you can’t just click it. You have to decide which domain you’d like to open it in first, and then copy it into that domain’s clipboard before pasting it into a browser. There’s also still a lot of work to be done to make USB devices usable in Qubes. If you want to do some Android development, it’s not the simplest task yet to get Android Studio installed and communicating with your phone over a USB port in an AppVM. Same with video chat. And same with figuring out a workflow to take a screenshot, crop it, and then tweet it. Many tasks are complicated in Qubes simply because you have to deal with compartmentalization and the limitations of virtualizing all of your software — but this is also what gives Qubes its strength. Debian with grsec doesn’t require this paradigm shift. Once you get past the initial PaX learning curve and make sure that the software you use most often all works, then it’s just like using any other operating system — but you get the invisible-but-awesome benefits of having a hardened kernel. USB devices, webcams, screenshots, and everything else work just like you’re used to. So if you’re not quite ready for Qubes, or if you can’t run Qubes for your specific work for whatever reason, Debian/grsec might be a good choice for you. The best of both worlds would be running Qubes, but with AppVMs that have grsecurity-patched Linux kernels. This is entirely possible, but no one has yet succeeded in doing it. Thanks for the great post, saved me a reinstall of Ubuntu after installing coldkernel. FYI for those installing from the Debian repo, and especially if you're having trouble at the sysctl step. I was denied trying to activate sysctl , but then was able to change the proper variables/values in /etc/sysctl.d/grsec.conf. I don't know if that's a new sid update, but I've referred to this blog post before and hadn't previously hung up on that step. any possibility to do this in debian stretch without installing jessie unstable? no? I installed grsec in Debian Jessie by installing it from the jessie-backports repo, and it seems to work fine, although I run into some issues when trying to run torbrowser. Does anyone have any idea on how to allow torbrowser to start? A note here for anyone who chooses to use apt-get for the pre-compiled package linux-image-4.3.0-1-grsec-amd64, rather than compiling the kernel. It seems that grsec's sysctl interface isn't enabled (I find /proc/sys/kernel/grsecurity/chroot_deny_sysctl=1 in the package; more at ). It would be enabled if you were to compile it with your steps. Runtime changes to grsec kernel params such as tpe (which I needed to disable to run torbrowser-launcher or any personal scripts; still figuring that part out) are then denied at your 'sudo sysctl -p' step. Please correct me if I'm wrong, I thought this info should make it here early in case others are deterred by this step Google didn't hit the answer very quickly). Thanks Micah, love your work! This article pushed me finally to try grsec and more. If you're willing to sync your password database to a remote server, then you could always make an AppVM for KeePass that has firewall rules that block everything except the connection to your remote server. And if the ctrl-c, ctrl-shift-c, ctrl-shift-v, ctrl-v thing is too much for you, you could always just keep your KeePass database in the AppVM that you use to browse the web, and use it's auto-type feature. In both of these cases your passwords might be slightly less protected, but no less than just using a password database in a normal operating system. And you still get all the other benefits of Qubes. Thanks! I'll make the firewall whitelist just the server and just do the the ctrl-c, ctrl-shift-c, ctrl-shift-v, ctrl-v thing. I'm hoping Qubes could at some point have some sort of system similar to 'split GPG'. So that an AppVM can request credentials from the KeePass VM. shame there is no grsec binary kernel in stable. I dont want to use sid. Also, the next level of hardening is using the grsecurity RBAC, which is extremely powerful. It has a utility called gradm which you can put in learning mode, then use your computer as you normally would and it will write a ton of data relating to your usage patterns and every permission/role/access/capability that is required. Then, it can write a policy file for the RBAC based on this data, which, when you enable it, will explicitly grant access only to the things you need to do. It's super cool! thanks for the great topics here on your blog! is there any security related reason why you now use Debian and not Ubuntu as you used to? also: could using disposable VirtualBox VMs for some risky tasks substitute the need for Qubes OS? As far as using VirtualBox VMs for particularly risky stuff, that's not a bad idea, but it's definitely not a substitute for Qubes. That's kind of a blacklist approach: "I think this task is risky, so I'll do it in a VM." But Qubes uses a whitelist approach: "Everything is risky, so make sure I limit the damage of every attack." For example, Qubes protects you against bugs in your wifi driver that could be remotely exploited -- the attacker will just hack your netvm, and won't gain access to all your data. 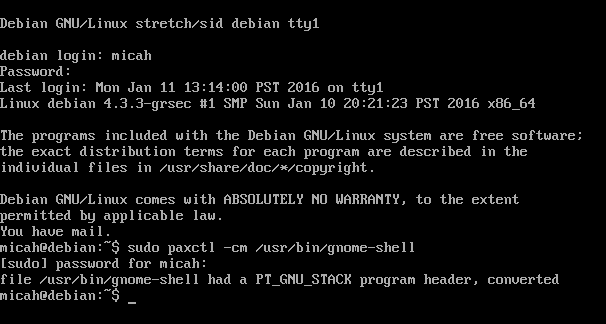 Now i know why my debian unstable system wouldn't boot with grsecurity kernel. But when the boot process get stopped by grsecurity, and won't start the graphical desktop, i didn't have the option to use Ctrl+Alt+F1 for further login. I must use the "single" option via grub kernel parameter, or i never see any tty. I also didn't compile the kernel with grsecurity, there was an usable patched binary kernel in the unstable repository. My system is fully encrypted too, with seperated /, /tmp, /var, /boot, /home, /var/log volumes. The / and /boot volumes are always gets mounted as read-only. This is perhaps an problem for grsecurity on first start. Any ideas? In one of Edward Snowden's revelations, the world got to know that American intelligence agencies routinely intercept, among other stuff, desktop and laptop computers that are on their way from the vendors to their customers. They would install surveillance rootkits on the motherboards of the machines. Would your hardened Debian be able to prevent or make it harder for the already infected motherboards to surveil on the activities of the computer user? Probably not. If you have malicious firmware on your motherboard, you can't be confident about the security of pretty much anything you do on that computer. Any chance you could make a guide for integrating GRsecurity with Qubes? How would you know if there was firmware or not on your motherboard? If the American Intelligence or any govt intel agency wanted to get malicious firmware onto all chips through agreements with chip makers, could they? As in full spectrum dominance. Actually the important question is what steps would gaurantee a clean motherboard? I do not know that much about this, but no one else has answered yet. 1: It is hard to know if the system is compromised on a closed system. 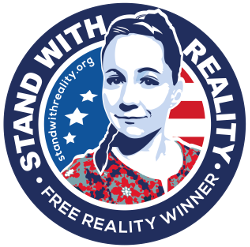 I would suggest checking out the free(as in freedom) hardware(fsf.org/resources/hw) if you really want to be sure. 2: They could use Intel's ME and AMD's PSP. They have this for system management mode(SMM). SMM has access to your CPU, GPU, RAM and internet if I remember correctly. It can also be used to turn your computer on remotely and operate without the users knowledge. 3: This is a bit complicated. The PowerPC is open but really expensive. There is a Chromebook that uses coreboot and an ARM CPU, it should at least be safer than Intel or AMD. There have been some attempts to overwrite Intel ME on some Lenovo laptops to install coreboot. Doing that involves opening the laptop and physically connecting to a flash chip, but you do not need to solder anything. Hello, Are the test patch have any valuable , and can be used (compared to release patch) ? Firejail is a quick and easy solution to contain dangerous applications such as a browser. I did not try it on a grSec machine yet, though. I can't verify the kernel. It's signed by FF992F6D and not the official signing key. I've tried re-downloading a bunch of times. Wtf is going on? Am I doing something wrong? It's good to have a hardened Linux kernel so the feeling of being secure is really true. To save myself from trouble of getting my hands dirty, I will just install Qube OS. Saw you tweeted "Though I'm not sure why "Return to function (memcpy)" is vulnerable in this VM, when grsec kills the process on other systems". Can you please update here if you figure out why? My setup's been giving me the same warnings on both memcpy tests and I've been trying to figure it out for a few days now. Happens on both the repository grsec kernel and compiling my own per above. Looks like the difference might be due to a bug in paxtest before v0.9.14. I was able to recreate this by running an older version (0.9.11) of paxtest that claimed the memcpy's were Killed. When I run the newer version of paxtest, the memcpy's are again vulnerable. This appears to be intended behavior to show that this class of attack is hard to defend against: https://forums.grsecurity.net/viewtopic.php?t=1420&amp;highlight=strcpy. Hi, I tried to install grsec on my disto Debian Jessie 8 Stable. I did the exactly steps, changed the sources.list did the apt-get dist-upgrade etc (..) reboot. However when I start to compile and try to install dependencies ( $ sudo apt-get install libncurses5-dev build-essential fakeroot kernel-package gcc-5 gcc-5-plugin-dev make ) I get this error http://beta.pastee.com/29ck9. Can someone help me to get pass this step? Problem solved. The repositories on sources.list were not correct. Does this changes the process? This is a very clear howto on an important topic, thanks! One tip: When you pipe tail -f though grep, it's good to hand grep the --line-buffered switch. I use xfce, how do I replace below gnome line for xfce4? " $ sudo paxctl -cm /usr/bin/gnome-shell "
Anybody know the corresponding command for kde desktop? I've tried 'sudo paxctl -cm /usr/bin/startkde' doesn't seem to want to work BTW I followed this tutorial using Arch Linux, and was able to get a gnome desktop working... Just like me some plasma better. It's been a while since I last used it, but by using the installer from https://www.debian.org/devel/debian-installer/ you can install testing directly and if I'm not mistaken also sid directly. I think it's in one of the Advanced menu sections. Using https repos and including the Tor repo installing of installing it from Debian are good things to do, but aren't necessary for security. Tor Browser Launcher (used in this blog post) downloads Tor Browser over https with certificate pinning, and verifies the PGP signature for you. The sysctl interface is enabled. OK, thanks Corsac. There must be something else keeping my machine from working with exactly these steps. Desktop users may want to compile the kernel_headers package too (add it to the make-kpkg command), since many drivers (ex. Nvidia, Radeon, VirtualBox, Openswan) require the kernel headers to be installed in order for DKMS (Dynamic Kernel Module Support) to work. Secondly, you may want to look into using paxctld or Subgraph's paxrat for a daemon to manage PaX flags on binaries. The issue is that every time packages are updated (eg. Python, Iceweasel, GRUB) they will lose the headers, making it necessary to run paxctl again. You can make all that configuration persistent in /etc/paxctld.conf, and paxtld will apply the flags on any update to the binaries specified in that configuration file. Unfortunately, neither of these packages are in Debian repos as yet. Do you think Grsecurity is better than SELinux? SELinux is of the "policy " class: it denies some operations to some programs. Most distros have sub-par support for SELinux and many people disable it because it's too annoying for their particular use case. PaX/grsecurity is of the "anti-exploitation" class: its wide set of features provides various means to prevent vulnerabilities from being successfully exploited at all, or at least making attackers' lives exploiting vulnerabilities very much harder. the binary forms of the PoC assume the standard layout of the structs, which the RANDSTRUCT feature randomizes, yielding a segfault in most cases. Two recent holes in mainline kernels are based on reference count overflows, which PaX's REFCOUNT has been protecting against for years - simply killing the process upon an attempt to exploit a refcount overflow. I could also mention the better randomization of ASLR + mmap, the ability to randomize the kernel stack base, memory sanitization of areas that mainline doesn't sanitize (and therefore elimination of various information leaks or use-after-free errors), usercopy hardening, protection against a number of integer overflows, or the eviction of recent features whose insecure implementation yields a stream of vulnerabilities, such as the eBPF JIT. SELinux or the other "policy" frameworks provide none of those features.